A woman sits on the sandy ground of her homestead breaking hard marula fruits open. When she has a pile of the nutty fruit, she sits patiently with a spiked object and removes the kernels. A few chickens scuttle about, an old grandmother weaves a basket and around the simple homestead the tall makalani palm trees rise into the blue sky of an autumn day. 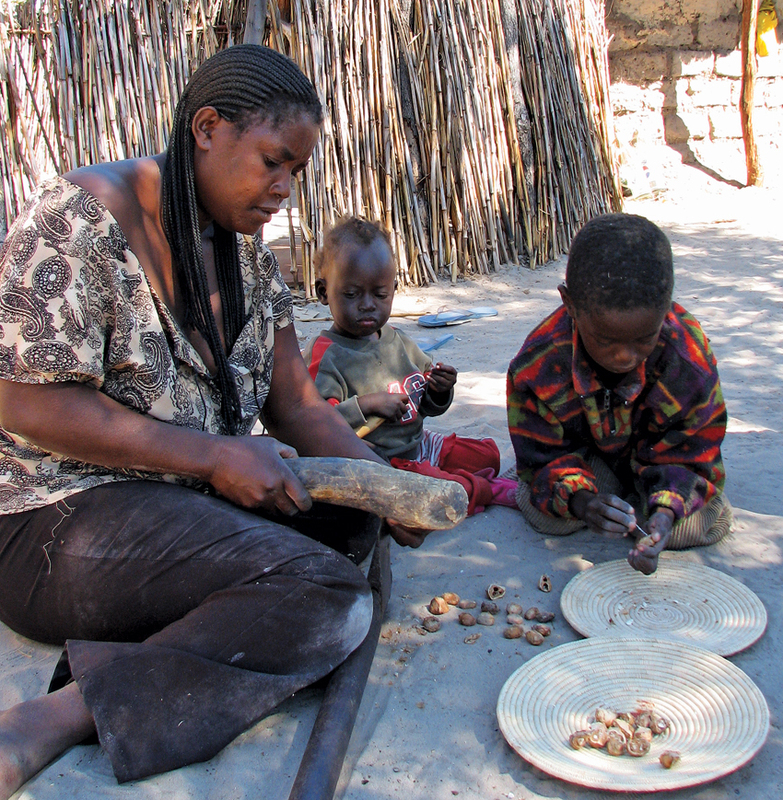 In homesteads all over the northern reaches of Namibia, women sit on their own or in small groups, painstakingly removing the nutty kernels embedded in the fruit. When they fill their small baskets, they pound the kernels with pestle and mortar to produce precious drops of oil. This delicious marula oil is added to chicken and wild spinach dishes, giving them a rich and full taste. Marula fruit plays an important part in the lifestyle of the Owambo people. Every year one of the eight groups holds a festival to celebrate the marula harvest. During the celebrations fermented marula juice is enjoyed by all. The traditional Owambo court doesn’t operate for the three months of the harvest. The age-old traditional food source grew into an industry when marula oil was identified as a valuable economic product by the Centre for Research and Information in Africa, Southern African Development and Consulting (CRIAA SA-DC). The Eudafano Women’s Co-operative consisting of 800 members in 17 associations began in 1999. The associations include the four Owambo regions, Oshana, Ohangwena, Omusati and Oshikoto. 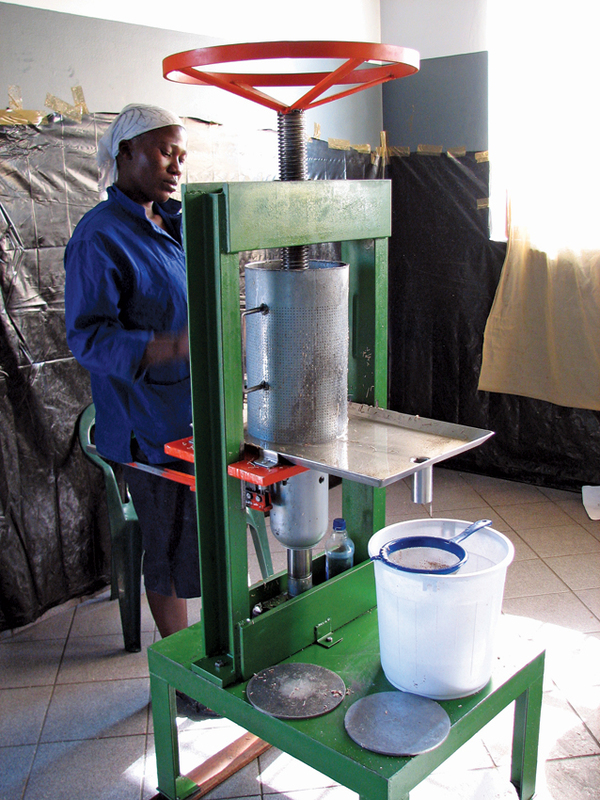 The women carry out the labour-intensive kernel extraction at home, bringing in bags of kernels to sell to the Eudafano factory situated just outside Ondangwa, Eudafano meaning ‘agreement’ in Oshikwanyama. The fresh fruit is also brought in during the rainy season to make marula juice, omagongo. The kernels are manually cold-pressed and the oil, omagadhi or ondjove, is used in products of the Body Shop, Eudafano’s biggest customer. 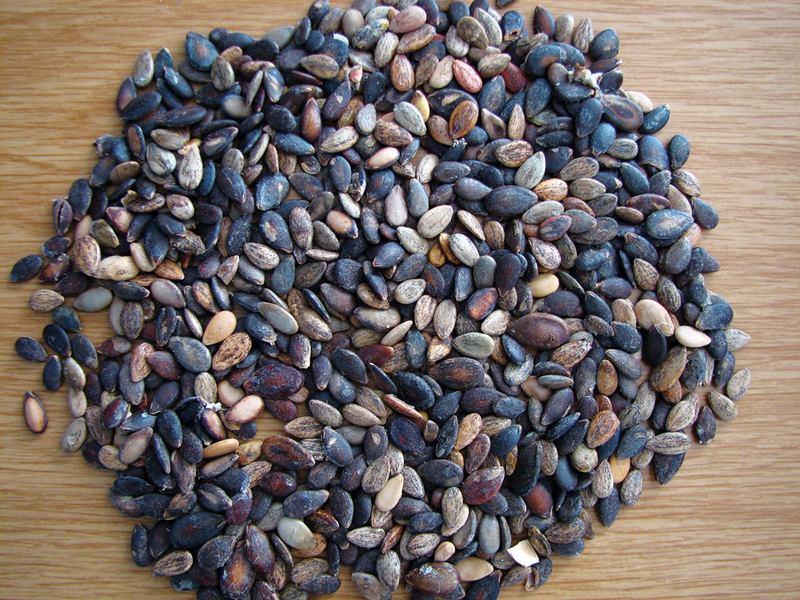 Melon seeds, oontanga, are also brought in and pressed for their quality oil used in moisturisers and massage oils. Eudafano employs eight factory workers. A nine-member board of women decides and distributes funds on a percentage basis. All going well, the Eudafano factory can produce eight tons of marula oil annually and half that quantity of melon oil. A large 40-kg bag of marula kernels produces 12 litres of oil and a 40-kg bag of melon seeds 10 litres. Large white bags filled with seeds and kernels wait in the factory’s corridors to be processed. Melon and marula cake, the bi-products of the process, are bought by the community for food for their pigs, goats and chickens. This successful women’s co-operative links two vastly different worlds. Glamorous products to keep the skin soft and supple stand on first-world Body Shop shelves. The marula oil ingredients take you back to Africa, to the north-central regions of Namibia, and then to the traditional homesteads. Encircled by wooden fence poles and fields of mahangu (pearl millet), the homesteads consist of a few huts or houses. Sitting in the shade of a tree, a group of women extract the small slithers of marula, piece by piece, laughing and chatting as they do this tedious work, making light of an activity that has been carried out by many generations of women. Around them children laugh and play, and the peace of rural life shines down with the good African sun. This article was originally published in the Flamingo July 2009 edition. A good article, thank you. Well written and with good pictures. I learnt something!